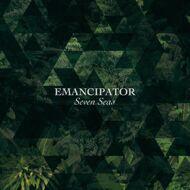 "There is simply nothing more welcoming to the ears than a new Emancipator record. Slathered with organic rhythms and dripping with fusion atmospheres, Doug Appling’s (Emancipator) newest creation is once again a freely majestic pilgrimage into the depths of worldly sound. Seven Seas could not be a more appropriate name, as the album could easily fit flawlessly as the soundtrack to an oceanic escapade lasting months, or even years, in exile. The inclusion of electronic elements is no foreign concept to Appling, but nor is it any predominant requirement. Occasional synthesizer beams scan themselves across the sound spectrum being produced. The focal point of each composition, however, remains the pressing organic elements signature to the Emancipator sound. Frequently accompanied by live violin, and more recently a larger arrangement in the form of the Emancipator Ensemble, Appling has shown tirelessly that the presence of live instrumentation is a key component of his vision. Teasing guitar strums and chiming piano keys often introduce the songs of Seven Seas. Each composition emerges out of its organic components. The structures are kept minimal, but steadily moving through constant evolution to maintain the listener’s interest. At the root, these are electronically produced instrumentals, but taking an overall perspective there is truly so much more happening within the confines of the record. Each track is segmented, implementing distinct sections through which its instrumental and production components can highlight themselves and bask in their own, natural beauty.